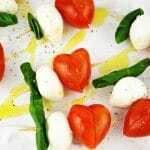 These fun Valentine's Caprese Skewers are a perfect fuss free appetizer using classic Italian ingredients you can't go wrong! Cut one tomato in half at a slanted angle (imagine one half of a love heart). Turn one half upside down and place the tomato back together to resemble a heart. Place on the skewer then repeat with the remaining tomatoes. Add one mozzarella ball to each skewer followed by a bail leaf. Place on a serving plate and season the skewers with salt and pepper. Drizzle with olive oil and serve.